Your thermostat can sense heat from warm objects nearby such as light bulbs, televisions and sunlight through windows. Avoid placing your thermostat next to these items for a more accurate reading. An inaccurate temperature reading can cause your air conditioning unit to run more than needed, causing higher utility expenses. Ceiling fans create a wind chill effect, and while they don’t result in an actual change in temperature, they can make your home feel cooler and more comfortable during the summer months. Using your ceiling fans and bathroom fans allows you to raise your thermostat’s settings by about 4 degrees, which can save you money and reduce your energy costs. Using a programmable thermostat, you can adjust the temperature to be comfortable while you’re at home, and then increase it while you’re away. By turning up the thermostat in your home by just a few degrees each day while you’re out, you can save as much as 10% on your energy bills. Shutting the blinds or curtains has benefits beyond adding privacy. By shutting your blinds during the afternoon hours, you can prevent the hot sun from heating up your home, which can cause your air conditioning unit to work overtime. Unless your home is brand new, the cooled air you’re paying to send throughout your home could be leaking outside through your doors and windows instead of reaching all of your rooms. When inspecting the areas you suspect might be leaking air, look for gaps in the frames or cracked caulking. Not only do they create drafts, but they can be especially problematic during heavy rain. Just like the rest of your appliances, your air conditioning unit will run more efficiently and effectively when it’s cleaned and well-maintained. By simply rinsing the outside of your unit, you can remove some of the dirt on and around your system, allowing it to cool your home more efficiently. If your air conditioning unit is in need of a little more TLC, Hanna Plumbing & Heating can help clean and safety inspect your system for a worry-free summer. 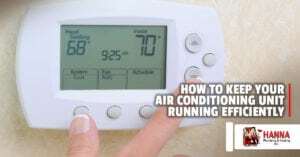 Want to schedule an air conditioning system tune-up? Learn more about our services or contact us for more information.